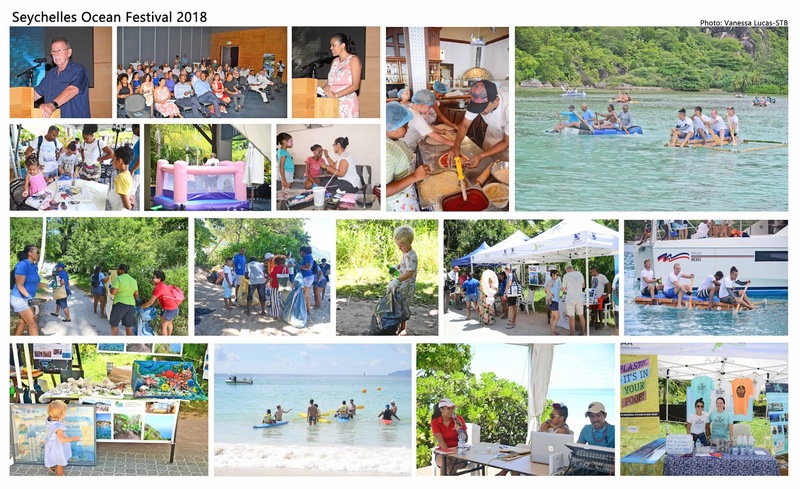 As part of its mandate to revive the Seychelles Ocean Festival, the Seychelles Tourism Board relaunched the event over the weekend of November 23 to November 25, 2018. The festivities were held as part of the global Year of the Reef campaign. The 2018 Seychelles Ocean Festival commenced with an official launch at Eden Bleu on Friday 23rd November attended by 50 or so invitees, including the vice-president of the Republic, several ministers, principal secretaries and CEOs. The invited guests were treated to an explanation of the philosophy behind the event, an introduction to the new STB diving brochure, and details of the Pristine Seychelles Campaign. It also featured the screening of the compelling film ‘A Plastic Ocean’ with its worrying analysis of plastic pollution of our seas and a visually impressive chapter of the Blue Planet 11 film on corals. There was also a small exhibition of model boats by Robin Port Louis, wooden fish by Egbert Marday and a painting by James Agricole. In parallel, STB also ran a Facebook photographic campaign with some impressive entries, eventually won by Sam Balderson. Speaking at the launch of the event, Seychelles Tourism Board (STB) Chief Executive, Mrs. Sherin Francis stressed on the importance of the Ocean Festival to Seychelles. “The Ocean Festival is an important embodiment of Seychelles’ marine scene and encompasses many different elements and is of equal relevance to our local population for the way it can sensitise them to the fragility of our ocean and the need to adopt sustainable practices to protect it and its diverse ecosystems,” said Mrs. Francis. From mid-morning to mid-afternoon on Saturday, the focus switched to the area in front of Eden Plaza’s Tamassa restaurant and a series of activities such as face painting, bouncing castle and live painting James Agricole. Saturday also saw a thrilling 20-strong raft race at Bay Ternay beach in which teams made up from the various NGOs competed with others from government and private sectors in a race that saw Skychef win the day with their innovatively designed raft. On Sunday, attention switched to Beau Vallon beach where the NGOs set up stalls and explained their work and projects to passers-by while K Radio broadcast live interviews with Sherin Francis, CEO of STB and members of the NGO community as part of a public awareness campaign. There was also beach volleyball and football competitions, body painting, a treasure hunt, Iron man & woman competition and a plethora of food & beverage stalls. “The 2018 Seychelles Ocean Festival looks to simply set down a marker for the years ahead and our intention to broaden its base yet further to incorporate all sectors of the Seychelles marine scene and, with greater lead-in time and resources at our disposal, to create a more fulsome event in future,” explained STB tourism consultant Glynn Burridge. The Seychelles Ocean Festival has its roots in SUBIOS, (Sub- Indian Ocean Seychelles) which remained a popular annual event for two decades, playing an important role, not only in showcasing Seychelles as a diving destination for tourists, but also in sensitising the local population to the beauty but extreme fragility of the surrounding ocean and its ecosystems. In the intervening years, the Seychelles marine scene expanded to include many other sectors such as the Blue Economy; sailing & cruising; conservation; diverse NGO activity; diving & snorkelling; sports fishing etc. and there became a need for a wider platform to encompass these new interests.